There is much to be said for intentionality and planning when it comes to the walk of faith . . . when it comes to life in general, for that matter. But sometimes, I suspect, there is just as much to be said for pure, un-thought-out, spontaneity. Today we had a combined service. Our church shuttled everyone to a neighboring town where we joined with a local community plant. One of the senior members of our Korean community has spent his life here in this country and in nearby ones, planting churches. This is one of the now-established ones. Over dinner tonight my husband and I talked about what a blessing it is to be a part of our church family. In a way, we didn’t really have to do the work normally involved in getting settled into a community, as new residents of the area, and country. We found this church within a couple weeks and, interestingly enough, this Korean community brings local culture to us, by way of weekly service opportunities, an international community in the church body itself, and events like that of today. The truth is that I was nervous about this weekend. The logistics of a time-consuming commute both days (worship practice and worship itself) and of figuring out how to combine our worship teams—backed up against a demanding work week—were daunting gremlins in my brain for the days leading up to it. But when it came down to it, as things so often do, the details came together smoothly enough, with less to fear than I had anticipated. It went well. After the team had finished, and I was enjoying the [relative] calm of being a simple pew-dweller, I realized that I might have to resign my post. As the offering wound down, it began to also pick up the pace. The custom here is to parade down the center aisle, row by row, in order to deposit one’s gift into the box. When only a few were still in line, instead of slowing down the music, the leader instead picked it up and started a new, more upbeat song. I couldn’t see what was going on from my vantage point, but I suspect that some in line began dancing up in the front as they gave their gift. With the beat picking up, several other dancing-inclined folks hopped up and joined in. Curiosity made me get up to go see what was happening. Shortly thereafter, dancing-inclined-tendencies made me jump right in to join them. If I had given any thought to this, I probably would have talked myself out of it. 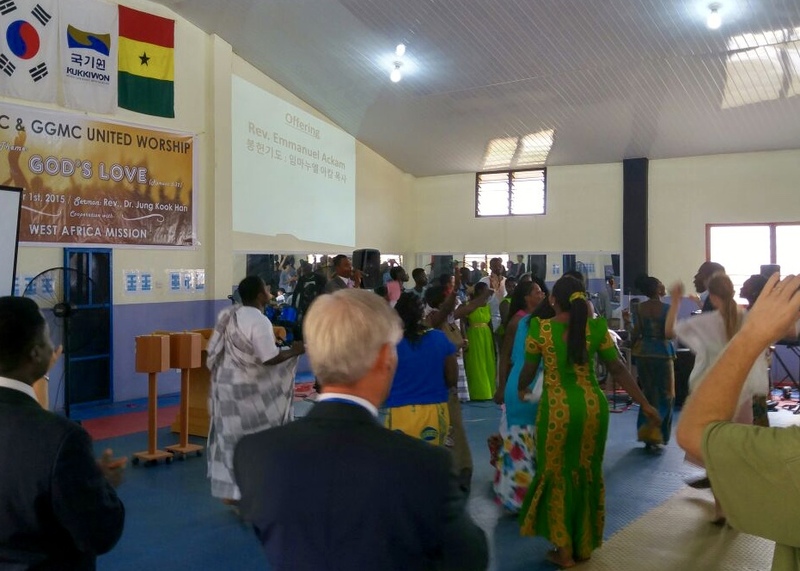 I would have thought through the fact that I had never been in this church before . . .that the only people dancing were Ghanaians I did not know . . . that there were at least 3 times as many people here today than I was used to being in a service with . . . that I did not know the cultural norms well enough to risk offense. But I didn’t think: I just danced. After a couple more choruses of dancing, the leader slowed things down and, taking our cue, we filed back to our seats. I couldn’t stop smiling from that point on. I don’t know what anyone else thought, but I was satisfied with this as decent enough confirmation of the feeling I had, and have, about the privilege of this morning’s worship.